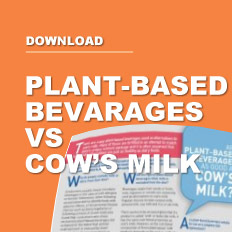 Plant-based beverages VS cow’s milk? There are many milk-like products on the market today. However, not all are real milk. Real milk comes only from mammals that produce milk, such as cows and goats. Many people choose plant-based products that look like milk over real milk because of lifestyle or dietary choices. Examples of such fake ‘milks’ are coconut milk, rice and oat milk, almond milk and soy milk. Cow’s milk and dairy products are nutrient dense. They provide high-quality protein and several important vitamins and minerals in a form your body can absorb easily. Health authorities worldwide recommend that we should enjoy dairy products daily for growth and good health. The South African Food-based Dietary Guidelines also recommend that we should ‘have milk, maas (amasi) or yoghurt every day’ as part of a healthy diet. Just because something is called ‘milk’ or looks like milk does not necessarily mean it has the same nutritional properties as cow’s milk. Plant-based ‘milk’ generally does not contain the same amount of protein and vitamins and minerals as cow’s milk. Both the amount and the quality of protein differ between cow’s milk and plant-based ‘milks’. Cow’s milk typically contains 3.5% protein, whereas most plant-based ‘milks’ generally contain around 0.5% protein. Because cow’s milk comes from animals, it contains all the necessary building blocks (amino acids) your body needs for growth and repair. It is called ‘complete’ protein. In contrast, plant-based ‘milks’ does not have the essential amino acids your body needs and is referred to as ‘incomplete’ protein. Even soy milk, which has almost the same amount of protein as cow’s milk, lacks two important amino acids, namely methionine and cysteine. Plant-based ‘milk’ is often fortified with vitamins and minerals. However, adding calcium to a product does not guarantee that it will be nutritionally equivalent to other products that naturally contain similar amounts of calcium. Calcium as found in cow’s milk is highly bioavailable and can easily be absorbed by the body. One glass (250 ml) of cow’s milk provides 300 mg calcium. This represents almost a third of the daily recommended amount of calcium in the typical diet of toddlers and young children. Teenagers need the calcium in about four servings of cow’s milk or other dairy products every day to build strong bones. 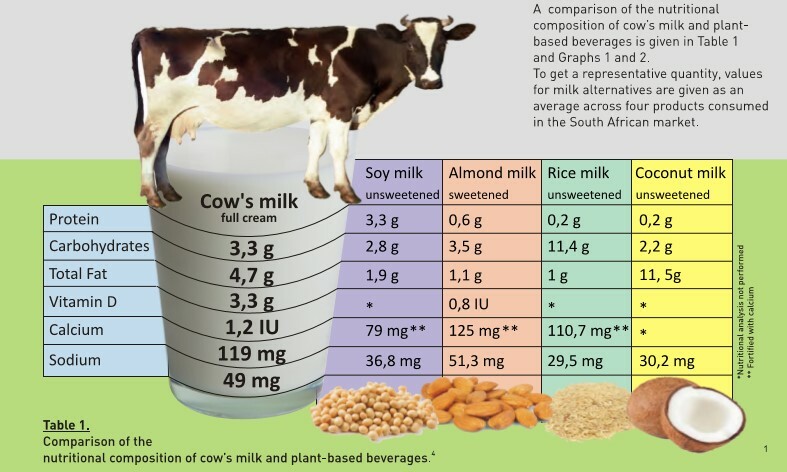 Four servings of cow’s milk will cost around R13 while the cost of four servings of almond milk will be about R46. The price of plant-based ‘milk’ may therefore make it difficult for teenagers to get the amount of calcium they need every day. What if you replace cow’s milk with fake milk? Excluding cow’s milk and other dairy products in favour of plant-based ‘milk’ may lead to nutritional deficiencies and possible detrimental effects with regards to growth and developments in children and adolescents. Remember: Use 3–4 servings of cow’s milk or other dairy products every day so that your body gets the real nutrients it needs.